Y’all, I’m super excited to share this ridiculously easy and amazingly delicious recipe! I’ll admit the flavors even surprised me with this one. Line a large baking sheet with parchment. Yes, this is important because it’ll help you roll it up once everything’s on there. You can also use a silicone baking mat, if you have one. 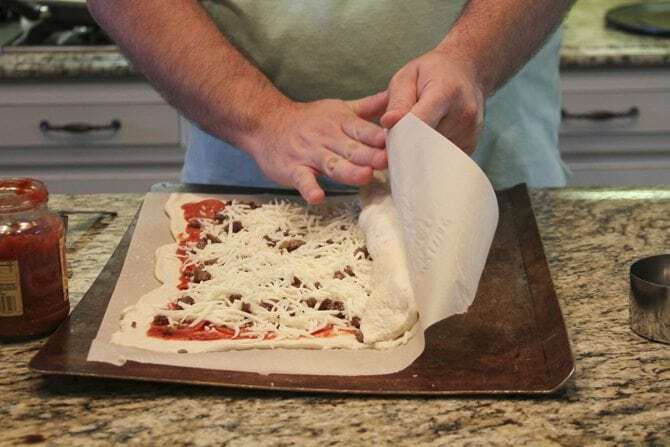 Then open the dough, unroll it, and stretch it thin. Next, top it with the sauce. I recommend you leave about a 1/2 inch gap around the edges. Next, add the sausage and whatever other toppings you might like. Then arrange it back in the center of your parchment with the seam side down. It doesn’t have to be pretty. Cut about 5 or 6 small slits in the top to let the steam out and to help get the crust cooked through. Then bake for 15 to 20 minutes or until deep golden brown. Serve hot with some extra pizza sauce for dipping! And there you have it! Y’all enjoy! Preheat the oven to 400° F and line a large baking sheet with parchment paper. 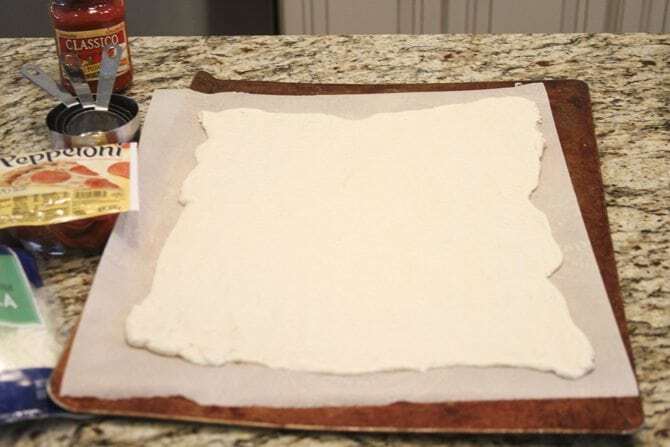 Open the can of pizza dough and stretch it thin and even on the parchment. Top with sauce, pepperoni, cooked sausage, and mozzarella cheese. Starting on one side, carefully roll the dough like a jelly roll. 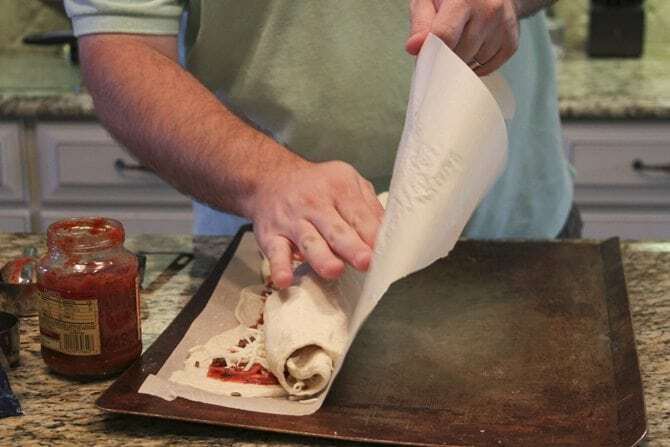 Slide to the middle of the parchment so that the seam is on the bottom. Cut several diagonal slits into the crust. Bake for 15 to 20 minutes or until deep golden brown. Served warm with extra sauce for dipping. Add your favorite pizza toppings as you see fit, just keep in mind that adding too much may result in a soggy crust. Oh my gosh….can’t wait to try this. I have a 23 and 27 year old at home and they will eat this up. I love your site!! Keep ’em coming. I hope they love it, thank you Stacy! I would love to make this, but it won’t print from any computers or my iPhone. Is there a problem with this page? We are having trouble with folks printing from iOS on iPhone, but are working on it. For the time being, try using a different browser and see if that works. That seems to be the fix for others right now. Copy and paste into email. Then print. I made this tonight and it was scrumptious. It was very easy, and my husband and son loved it. I added onions and probably too much sausage. After I rolled it, it was huge, but it was not soggy. I love recipes that are easy and delicious. Thank you. Sallie, I’m so happy y’all enjoyed this! I made another variation of the strombloi. I used lunch meats. I place imported ham then a layer of pepper ham. A layer of capicola. Genoa Salami, Cooper sharp cheese then pepperoni. Yupper that is the bees knees. Me too ! Going to make these for my grandson!Dad and husband ! 5hey will LOVE THIS ! Thanks ! 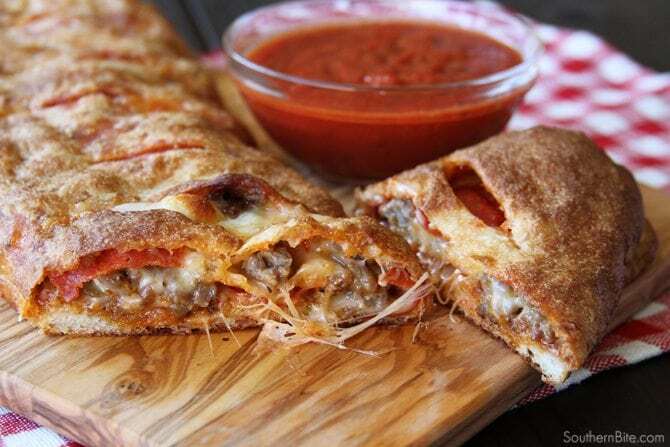 I have made two different recipe Stromboli lately but this looks like it will be my winner! I think the thin crust will make the difference. The first one I used left over Mississippi Crockpot roast (well drained) and added peppers and onions for a “philly cheese steak Stromboli” and the next was a traditional like this one. Both were good. I brushed the top with melted butter before baking and sprinkled with parmesan cheese…… they were so good for a football Saturday! Thanks for the recipe!! The “philly cheese steak” sounds fantastic and yes I agree, perfect for watching the game. Hope this recipe is a winner for you too! Your photo is making me drool. 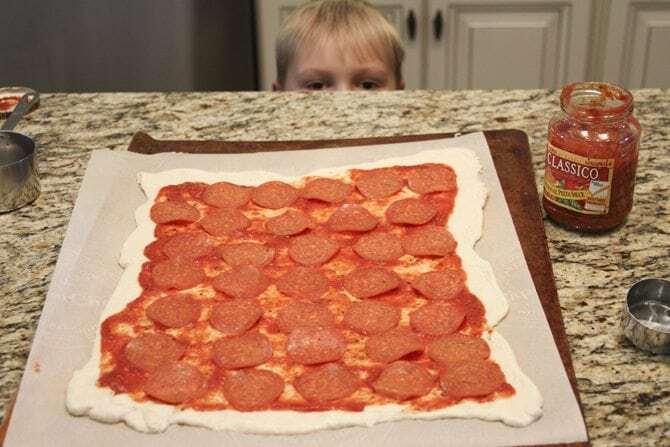 Let Jack know that he did an excellent job with his pepperoni placement. Another great filling is shredded cooked chicken, partially cooked chopped broccoli, alfredo sauce, and mozzarella or swiss cheese. Assemble and bake in the same fashion and be mindful of the soggy veggie tip. That sounds great! I will have to try that out sometime. It will take a little longer, but I grill my veggies before I put them in the Stromboli. Hubby likes them cooked through. His fave is Philly Cheese Steak with onions, green and red peppers and mushrooms. The Publix deli has fresh raw pizza dough by the pound, and is really thin rolled, or buy it as a ball and roll your own. This looks sooooo good! Whenever I read your blog, I feel like I’m back in Tennessee!!! I can’t wait to try this!!! Looks delicious! Definitely going to make it! Hope mine turns out as good as yours, being that I don’t have a cute little “pepperoni arranger” around anymore! They grew up on me! Thanks for sharing! OMG! Looks amazing! I could totally eat that whole thing myself. LOVE pizza! Thanks, Friend! I’m the SAME way! This sounds and looks so good I wish I had all the ingredients for it now. You have a very, very good helper. Thanks, Bev! Isn’t he precious!?!? This looks so good, Stacey! I have to try this really soon. Thanks for the tip about using the parchment paper, and thanks for another great recipe. Your son is so cute! I miss those years, (mine is 15, but don’t ask me where the heck the last ten years have gone. He’s still a wonderful kid, so no complaints here.) Have a terrific weekend! 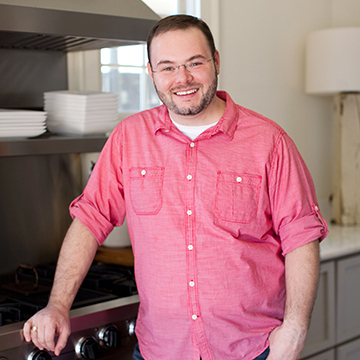 I love your postings and recipes — wishing that you would identify any recipes you post that are in your cookbook — I have the cookbook and to be frank the last thing I need in this house at this stage of the game is copies of recipes that I already have — know what I mean? None the less — keep on posting recipes. 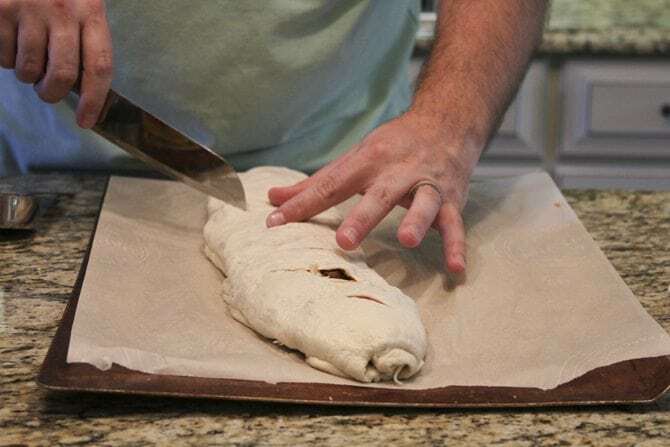 I have been looking for an easy stromboli recipe and although I don’t do pepperoni bet I can do this to my own taste — wanna bet? Stacey , Not necessarily pizza either. My next venture with this will be well drained spinach and garlic with Vermont Cheddar. I cant wait. Or maybe asparagus chopped broccoli with another cheddar. Hmmmm you got me thinking now. My husband and I made the Stromboli last Friday. It was really good. 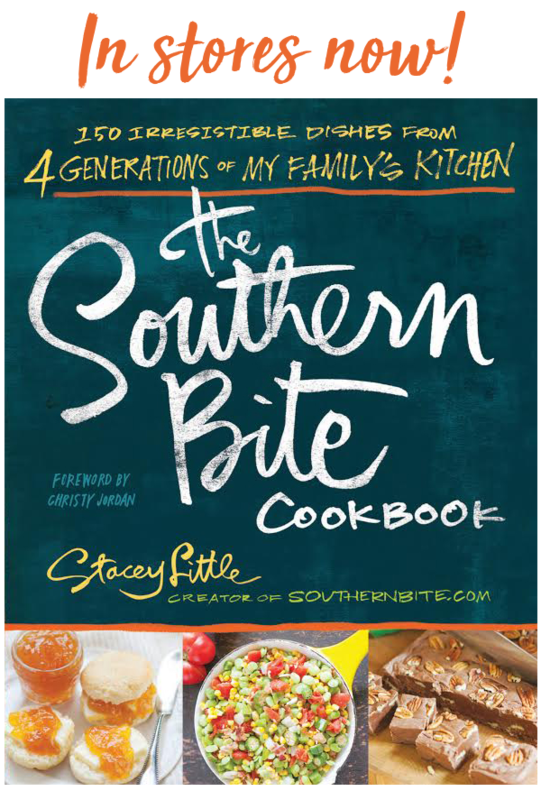 Stacey, I work at Southern Homes and Gardens and we would like to know if you would come for a book signing. Please let me know if can. Hi Mary! I’m so glad y’all enjoyed the stromboli! I’d love to come to SH&G! I got an email from Julie and replied, but never heard back. Looks yummy – I pinned it for later. Made this tonight for dinner. It was delicious!!! Used regular hamburger and onions for the topping instead of sausage. Drained it really well. A little Italian Seasoning. I cooked it for an additional 5 minutes and it got slightly browned but not like the picture and not as crispy. Will try it again increasing the temperature and or maybe the cooking time. Worth trying again. Maybe some butter on the dough before baking. Thanks for the recipe. I see this with mushrooms! Absoutely! One of my favorite toppings! This was EXCELLENT – low crust and could taste the ingredients – Problem, you need a family of 4 to eat it all! We had a salad first and have put the rest in refrigerator to reheat this weekend. We used mild sausage and pepperoni – mushrooms would be a great add. The Thin Crust was the special ingredient to this recipe. Little clean up. Love to hear it, Mari!! Hi again, Stacey. We made this stromboli today and it was excellent! We made one just like yours, with cooked sausage, pepperoni, and mozzarella cheese. Plus, we also made a vegetable one with sautéed yellow and red peppers, red onions, and mushrooms, some sliced black olives, and mozzarella. Delicious! The thin crust was perfect. Thanks so much for the tip of using the parchment paper to roll it up. I always have a hard time with this stuff, but the parchment paper was the trick. Thanks for another great recipe, Stacey. Have a great week! Yum! So glad you enjoyed it, Samantha!! Found this recipe in Diabetic Recipes on Pinterest. Is it truly diabetic? My husband would love this. It would make both of us super happy if this is a diabetic recipe & not one mis-pinned! Thanks for giving me a different idea for dinner! I’m not sure how it ended up there but there are obviously carbs in the crust and some in the sauce depending on the brand. Hi. Is it possible to take a few articles to my website?Of course the link to your site I’ll leave . Hi Ellen, you’re welcome to share links, but please don’t share the entire recipe on another site. Just made this and pulled it out of the oven! Was super easy and looks soooooo yummy! That’s great news, Kristi! Hope y’all enjoyed it! I saw this in Pinterest this morning and my stomach was growling the whole day. I’s going in the oven as soon as the kids’ pizza is done. We went with ital sausage and pepperoni. Hubby added ham to his side. I like the suggestion of melted butter and parmesan. I’ll be adding that too! Yum! I sure hope it turned out well for you! OH my gosh. This looks wonderful. I’m gonna have to try it! Jack did an amazing job on those pepperonis by the way! Thanks, Samantha! Hope you’ll enjoy it! I’m going to make it tonight for church. I’ll let you know how they liked it! Update: Not one smidgen left after everyone got a hold of it at church! My husband said, “Why don’t you make this for us at home?” I assured him I will! Thanks, Stacey, for a keeper! Ha! So glad everyone enjoyed it!! We just finished this and my husband said at least three times how good it was. ? I had to tutor a student and she got here late, which put supper late when she left but this was quick and easy. (I already had Italian sauage and hamburger browned so it went together in a snap!) thank you for a quick and delicious dinner! Awesome to hear, Denise! I’m so glad it was easy for you and y’all enjoyed it!! This turned out wonderful! And it was very easy!!! I turned the oven up to around 425* and also brushed some olive oil on the outside to help it brown up nicely. I just kept a close eye on it so it did not burn. Inside, I stuffed it with 1/2 lb Italian sausage (that I needed to use), onion, mushrooms, pepperonis, and cheese. I sautéed my veggies first and made sure to drain the sausage and veggies well before using in the Stromboli. No soggy Stromboli here! ? It was a hit with the parents and semi-picky kids! ?? Sounds delish! Glad it was a hit! Made this tonight with my daughter and we LOVED it! So quick and easy and tasted great! Thank you so much for the recipe, this will be a family favorite for sure. Such great news! I’m just tickled y’all enjoyed it! This is my family’s new got to recipe. I egg wash the top and add shredded Parmasaen cheese. Awesome!! So glad everyone loves it!! I’ve made this recipe & it’s fabulous!! It looks like I really worked hard to make it!! I didn’t tell them otherwise!? Your secret is safe with me! 🙂 So glad y’all enjoyed it! Mine burned to the bottom of the parchment paper and smoked up the house! Still tasted good though! Sooo funny story learned the hard way! Wax paper and parchment paper are NOT the same thing. And even though the wax paper says it’s good for baking – it lies big time :). I also learned that when the husband (who does not cook) becomes curious about the odd odor coming from said oven, one should investigate immediately. Luckily there was no fire and only a bit of smoke but it’s 100 degrees in S. Ga today and opening the windows was met with “Are you crazy?” but it kept the smoke detectors from going off. So while I salvaged dinner – same said husband felt the need to tell me how not good wax paper is in the oven…..sigh. We had a really good laugh later and the Easy (not so on first try) Stromboli was wonderful! It’s a keeper…..as long as I use parchment next time! LOL! That is hilarious, Beth! I hate you had trouble, but I’m so glad y’all enjoyed it! Oh no!! Ya know I didn’t know that either!! I am making this TONIGHT!! And I just read your comment and thought, “I know I only have wax paper” so sure enough I look in my kitchen drawer and it’s WAX PAPER!! What do I do?? I DO have those mats though!!! Will that be better?? Spmeone HELP!! I see others saying theirs burned as well!! If I use the mats will the temperature and or time change?? The mats will work just fine. No need to adjust the cook time or temp. Beth, you have to come over to the not dark side of parchment. You need one you are working from and one in storage. During the holidays, maybe ! I made this recipe tonight and it was ssssoooo good…..the only change I made was to use beef instead of sausage…..Will be going in my regular rotation.. Awesome, Susan! So glad to hear you enjoyed it!!! This looks so tasty!! I’m thinking of making it tomorrow for Sunday dinner. I’m guessing that one would serve about 3-4 depending on serving size? Can’t wait to give it a try! This looks so tasty! I’m thinking of making it for Sunday dinner tomorrow. I’m guessing it would serve 3-4 depending on serving sizes? Can’t wait to try this! Yes, maybe even 4 to 5. Enjoy! Thank you thank you thank you for sharing this recipe!!! This reminds me of calzones we used to make growing up, but so much easier. The pre-made thin crust is a lifesaver. I added some ricotta cheese and it was amazing. Awesome! So glad to hear that you enjoyed it, Chelsea! I am wondering if this could be made ahead and baked just before it is needed. It would make a great addition to our appetizer Christmas Eve, but not a lot of time to put it together and bake it after out church service. It would be nice to have it ready and just put it in the oven. What do you think? Thank you! How early are you thinking, Suzanne? I think it could be done a little ahead of time but not days. I made this for dinner tonight and it was a huge hit with my son and hubby! I especially appreciate the tips and photos of how to roll it up. That made it much easier to figure out. I am dreaming of all the different fillings I can put in there! I brushed mine with a little melted butter mixed with garlic powder. Thanks for sharing! I just love hearing that, Sarah! So glad y’all enjoyed it! Make sure you let me know how you get creative with those fillings! My results with this recipe were terrible 🙁 I’m just wondering if you assumed that people would spray the parchment paper (and if it didn’t need it, I don’t know what kind you used). Ended up scrapping all the dough off the paper then trying to piece it together and then transferred it on to a SPRAYED pan. Taste is fine but was very sad with the process. Hmm. I sure hate to hear that. No, there shouldn’t be a need to spray the parchment and no one else has reported this issue. So strange! I wonder if it wasn’t parchment paper? Or maybe if the parchment paper wasn’t lifted when trying to fold, it might be harder…especially in warmer temps. We followed the directions exactly and lifted while folding…Had no issues! Thanks for the insight, Noelle! I buy it ground in bulk, not in a casing. If you can only get it in the casing, you’ll definitely want to take it out before cooking it. You are also welcome to buy pre-cooked and crumbled breakfast sausage to make it even easier. Enjoy! Thanks so much for this recipe, it was excellent! I too was amazed at how good it was. I made my own pizza sauce (food.com-excellent pizza sauce), and I served the leftover sauce on the side to dip. The crust came out crispy, just the way we like it, and the inside was moist and tasty, not soggy at all. I’ll definitely be making this again! Thank you for posting this recipe, it’s a new family fave! I am so happy to hear that you enjoyed this recipe! It’s definitely one of our favorites! Hi Pete! Are you using the print button that in the recipe card at the bottom of the post? My new favorite. I’ve shared this link to my friends and family. Everybody loves it. Thanks for sharing this awesome quick recipe. That’s so awesome, Stephanie! I love hearing that! Putting ground sausage, pepperoni, deli ham and mozzarella!! And serving a salad with them! Can’t wait to TRY!! Thanks so much for the idea! This is so-o-o good and much easier than I ever would have guessed!! I have a filling tip for ya. You know how two tastes from opposite ends of the scale just work out good? Everybody knows what the green bell peppers taste like, people I know who don’t like them have been rather surprised that red bell peppers are actually sweet! 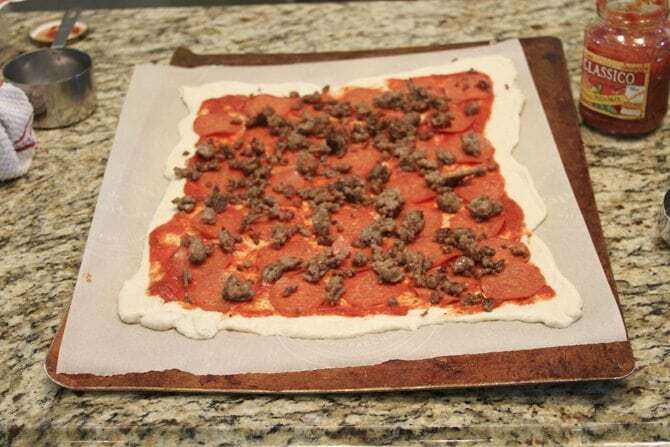 Combine them in pizza with zesty sausage and the results will really tickle your taste buds. My ma in law (hates green bell peppers) just RAVED about how good mine turned out, especially since she knows I’m not a great cook. So glad that you enjoyed this! Yes, red peppers are much sweeter. Did you know that green and red peppers are the same thing? Those red ones just stay on the plant a bit longer. Enjoy! Looks delicious! Ready to try it. Whats the best kind of sausage to use? Thanks! I like to use ground Italian sausage. Hi there! I think I bought just regular pizza crust, not the thin crust. How will this change/impact my stromboli? Shouldn’t be huge issue, just make sure to stretch it thin. Enjoy! I made this tonight for dinner, we loved it, such an easy dish. I couldn’t believe there were people who messed up this great 5 ingredient recipe, it shouldn’t burn or smoke or anything like that. My HEB didn’t have thin crust so I used the classic crust with no sausage. I will look for the thin crust at Walmart next time and vary the toppings. I love having a clean kitchen after dinner, this was great, thanks! Love hearing that, Crissy! So glad y’all enjoyed it!! What degree do I set the oven??? I can’t seem to find that bit of information. Made this right now, no sausage but added salami and black olives. Excellent! Easy and tasty. Best part about this is that my 8 year old son made “yummyness” with his mom! Thank you! Awesome! Love hearing that, Jessica! Going to make this tonight! I am toyingoing with the idea of making a ham cheese along with a regular pizza style. Looks nice and easy for a cold and gloomy Monday. I think that sounds perfect! Turned out great. Used sliced ham instead of sausage and added some thinly sliced bell peppers, onions and black olives. Drizzled with olive oil, some garlic powder and parmesan. Soo yummy! Awesome! So glad it turned out well for you!! I made this tonight as a new twist on pizza, and it was a HUGE hit! It was so easy and super delicious! Thanks for sharing! Awesome! So glad y’all enjoyed it!! Can not find thin crust pizza dough any where! Anyone used the regular and if that doesn’t work have a homemade recipe?? The regular will work just fine. It just might need to be baked a bit longer. was always intimidated by homemade stromboli until now. had this for dinner with ham, cheese, mushrooms & peppers. so yummy. so easy. thank YOU! That’s awesome, Paula! So glad y’all enjoyed it!! We made this tonight with our 4 yr old twins. IT…WAS…AMAZING!!!! Fantastic! I love hearing that, Noelle! SO glad everyone enjoyed it! Gathering recipes for Super Bowl Sunday and this will work beautifully….a little heartier than just dips. Hosting 4 couples, most of the guys have huge appetites so I better make two. Anxious to give it a try. This is perfect for game day! Hope y’all enjoy!! I totally agree! Get creative with it! I can’t find thin crust anywhere. Is it possible to half the normal classic crust and just make two? Roll them both out thinner? Or just do one and bake it longer and if so how much longer? Thanks! 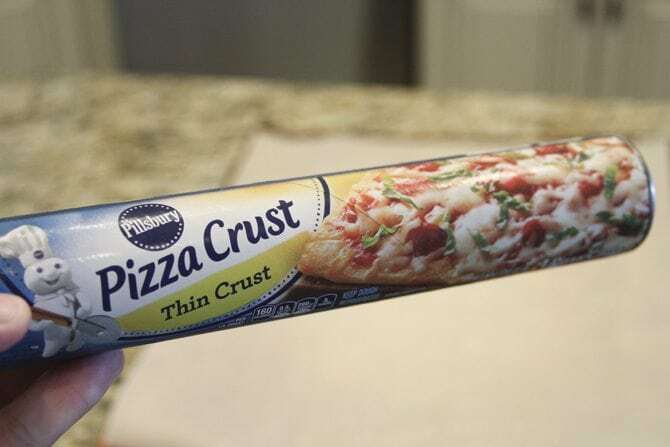 I’ve heard from several people that used the regular crust and just rolled it out a little thinner. Cook time should be about the same – maybe an additional 5 minutes. Made it tonight. Quick, easy and everyone liked it. Wow! Will definitely make it again. So glad to hear you enjoyed it, Brent! You are SO welcome! So glad you enjoyed them!! What are the dimensions you want for the crust before putting on toppings? I’m honestly not too sure, Clay. I would recommend following the instructions on the can in terms of how to roll it out. I’m guessing it was about 12″x16″. Well I prefer thin crust pizza, I’ve never been a fan of stromboli or calzones but my boyfriend loves all things crust and all things meat so I made this for us tonight and wow I’m actually in love with this meal! He said he was “turned on” by this so I’d say he liked it too. So easy, but so delicious and better than anything I could order in a pizza parlor! Can’t wait to try other recipes, especially the reuben stromboli one! Want to try this out with a veggie packed version and Philly Cheesesteak version as well. Those sound like so GREAT variations, Katy! So glad to hear y’all enjoyed this one! Wow! This looks soooo good! Love those little eyes spying over the counter! Looks delicious. I know what Friday’s after Thanksgiving dinner is going to be now. Thank you so much. Have a happy and blessed Thanksgiving. This would be perfect for that after the holiday decadence! Enjoy! Happy Thanksgiving! I’ve made this on many occasions with a variety of ingredients. It is truly a great recipe! The one I love is sausage, pepperoni and mushrooms. I would encourage everyone to try this recipe! Thanks, Michelle! It’s one of our favorites, too! Hey Stacey! I just made this for my step-son who is always wanting calzones. I think he liked this more! Had a little trouble with sticking when the dough was raw but I think that’s because I used wax paper. But as with dough, I used a fork and kind of pushed the inside back in and pinched the dough. Problem solved! This has been a great recipe to help me teach our little guy some moves in the kitchen. He’s usually the stir and saute master but today he was the arranger and herb sprinkler. Love hearing about getting those little ones in the kitchen and I’m just tickled y’all enjoyed this, Amanda! Tonight I’m making a chicken, spinach and mushroom one for me and my husband! This concept just works all over the place! Yum! I know, I just love it! As long as you space them far enough apart or on separate pan, they should be fine going in just as written. It might take 3 to 5 extra minutes. I want to use mushrooms, peppers, and onions and was wondering if I should sautee them first? Hey Stacey! Love this recipe, will use it next time we have an appie night when we invite friends in for drinks and…appies, of course! Thanks much for all you do for us. Love the pic of your sweet little one! Blessings to you and your fam. Thanks so, so much, Phyllis! Can’t wait to make this. 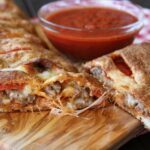 My husband loves calzones and I think this will be a winner! Sure hope y’all love it! Oh my goodness. This looks so good! I need it right now. I think this will go on my meal plan for next week. It’s so good and so easy! Hope you enjoy!! This looks so delicious, and I love that it’s inexpensive and easy! Thanks for sharing the recipe! Years ago a pizza shop had a strombolli sandwich made with the same steak strips used in a cheesesteak sub. Instead of tomato sauce they used a mushroom brown gravy and provolone cheese. They were to die for!!! Thanks for bringing back a great memory and a great idea for supper!! Do you think this can be prepped the night before and cooked the next day? I’ve honestly never tried it that way. If you give it a go, be sure to come back and let me know. I’m just adding to your long list of positive reviews. Turned out perfect, very easy, husband and son loved. Made exactly as written. Not at all hard to make your own pissa crust. I use the recipe on the King Arthur Flours website! 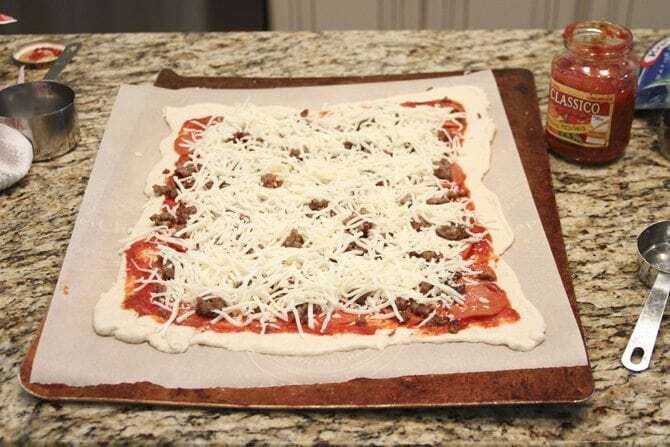 I found this recipe last night, so I hit Walmart today, got 3 cans of the Thin pizza crust and I’m planning on making this tomorrow night!! Thursday night football & our Eagles are playing!! Cannot wait to make these! Thinking I should’ve bought a few more dough cans LOL !! 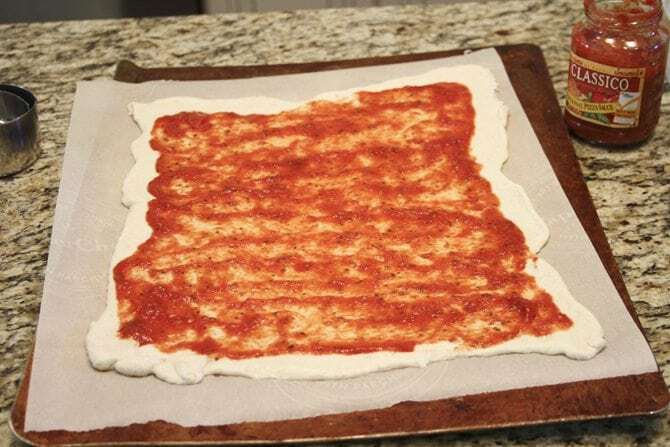 Every grocery store in my area is out of thin crust dough…do you think it’s doable with regular dough? I think you could use the regular dough and just stretch it a little thinner. Good luck! Hi love this recipe can’t wsit to make them! I’m going to make 4 for a dinner party can I roll them and set to the side or in the fridge until I’m ready to bake? Thanks in advance!! I don’t see why not! Enjoy!! My family has a new fave! This was so easy to make and using the parchment paper works out great. I used Pepperoni, Onions, Bell Pepper, Black Olives. Sauteed the veggies in my red copper skillet to keep the amount of oil needed down so it wasn’t soggy. Crust was golden brown and perfect. Easy and delicious. I made two last night. I used a pampered chef rectangular baking stone. The first on I tried the parchment paper but was too sticky. I sprayed the stone with oil, didn’t use the parchment and it was easy to spread the dough out and roll up. But without baking it with the paper, the bottom browned too much (wasn’t burned, just darker than normal) – I will definitely cook on parchment next time. However, the second one I reduced the temp to 350 once there was browning and the bottom was perfect. I do prefer a more brown crust, so I say definitely use the parchment while baking. I also used roasted tomato pesto rather than sauce and it was truly so much better. I’ve done that a few times out of necessity, but forgot how much better it tasted until I did it again last night. I am so glad I saw this recipe. My husband said it was better than a restaurant- and it was! Awesome! I’m so glad it turned out great for you!! Thanks, Tess! Hope y’all enjoy!! Idea was good and my ingredients were good but oh my gosh, had a horrible time trying to roll the #$*!# thing, so I will not make again! I baked the mess and ate it anyway! Fortunately I had not made it for company. I have enjoyed many of your recipes but this one is going in file 13! Hate to hear you had trouble. Were my instructions on using the parchment helpful at all?